Here is a System Diagram for the G8 Microserver from the product planning stage. It differs from what we now know we will get, but the basics are there. The original Microserver System Diagram. This seems to be from earlier in the product design phase. 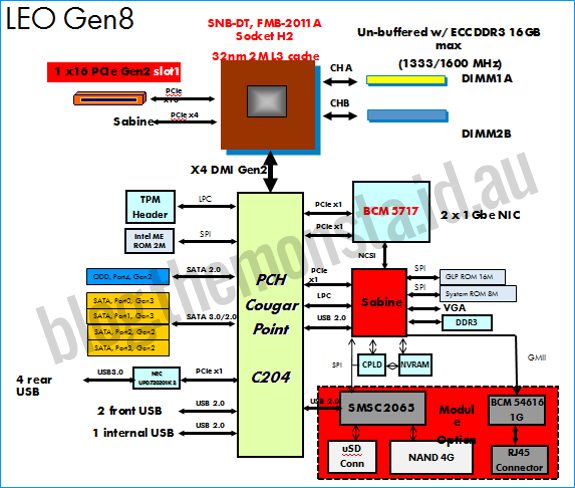 It seems like there will only be one SATA port based on the Beta Units and also the images and documentation coming from HP now, where this slide suggests it will have two. I am almost certain that the chipset will actually support two SATA ports, just that there is only one on these models. 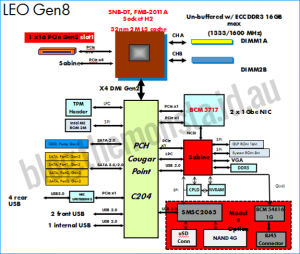 We may see a second port on an ‘updated’ model with faster CPUs just like the G7 models – and there is possibly a quadcore CPU on the horizon. Missing from this slide is the Micro SDcard on the motherboard. Also the iLO ‘option’ in the red square on the bottom right-hand side is now confirmed as standard and not an option module. ← Customisation of the Microserver – HP to steal ServersPlus ‘Pimp My Microserver’ idea? What a bummer. The ODD port is sata 2 not 3. I can imagine people using that port for a SSD instead. Well…hopefully this week we get some insight on the bios being used. Perhaps it’s configurable. So if I read this correctly its using a socket 2011 not the 1155? I noticed a lot of new low power CPU’s coming out in the new socket 1150. I guess FMB 2011A refers to the TDP class the cpu is rated not the socket (1155). Probably 35W max. Looks awesome, I wonder how long until we see them hit Aus via ebay or other online sellers….